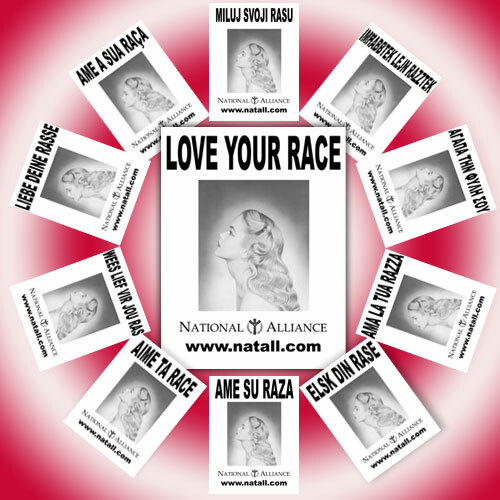 Starting now, the National Alliance is once again making its Love Your Race campaign into an international outreach movement of worldwide scope — a Valentine’s Day present to all European-descended people of good will around the world. Our message: Love Your Race. In the text version of this broadcast at nationalvanguard.org are high-resolution downloadable copies of our simple and beautiful ‘Love Your Race’ flier in 29 different European languages. Download the one appropriate for your nation and, all this month, with a special emphasis on Valentine’s Day, the 14th, distribute them as widely as possible. If you can provide a verified translation for a European language which does not appear on the list below, please send it to us via our contact form on this Web site, or by writing to us at Box 4, Mountain City TN 37683 USA. Be sure and let us know how many of these fliers you have printed and distributed, so we can encourage others! There are myriad legal ways to give these fliers to people in your community — so always distribute them lawfully. Thanks to the volunteers who gave us these translations — and thanks to every single one of you who does what it takes to get the word out. ARE THERE laws of race-formation and evolution just as there are laws of motion and attraction? Let us consider the simplest, most basic, and most important of these laws. I claim no originality for the idea I’m about to express, though you’ve probably never heard it before. After I explain it to you, you will be astounded that it wasn’t taught to you in school — astounded that you never heard of it before. You never heard of it because its implications have the power to shake the power structure that misrules us to its core. It is this: Life is continuously evolving in the direction of ever-greater differences, and it is evolving only in that direction. Life began with the first molecule capable of self-replication. Purpose (survival of the life form and its descendants) and morality (actions that lead to a greater chance of survival) were born at that moment. Though complex by molecular standards, these first glimmerings of the Life Force were very simple compared to even the single-celled life forms that came later. From the development of the cell wall (a kind of “border wall,” if you will) which was the first demarcation between the creature and the other creatures around it, and between the creature and its environment — to the development of multi-celled colonies and eventually multi-celled creatures sharing the same gene-patterns and possessed of a single purpose — to the development of sense organs and response mechanisms capable of detecting changes. opportunities, and dangers in the environment and dealing with them — to the development of consciousness, memory, emotion, instinct, and reason — life has taken a path of ever-increasing complexity, capabilities, consciousness, and differentiation over time. It has become ever more different from non-living matter. It has become and is becoming ever more different from the simple life forms which began the process. At the beginning: utter simplicity and sameness. At every step of evolution in the billions of years since then: more and more difference from those simple beginnings — and more and more difference from the steps immediately before the current step in the evolutionary process. Constantly, in a never-ending process that will last, must last, as long as Life exists, ever-increasing differences over time. This principle of ever-increasing difference rules Life not only in the dimension of time but also in the dimension of space: As creatures obey the morality of survival, and expand their kind into new territory, they compete with other life forms already in those new territories. The creatures with the best gene-patterns among their kind for that particular environment and that particular situation and that particular competition are selected for, and prevail — and so the process of change continues. A species that was once one, spreads out into new areas, evolves slightly differently in each area, and eventually forms new subspecies — or races — of the same species. If these differences and the separation persist, the subspecies eventually become new species. Space and time are inextricably linked, and the ever-increasing differences seen in life-forms when distances increase reinforce the differences that are generated by the Life process over time, and vice versa. So as you explore the history of Life in spacetime, you find the principle: The further you travel from any given point in space or time, the differences increase — except in one direction. That direction is the past. In fact, one way to distinguish past and future is this: The future is the direction of ever-increasing differentiation and upward evolution of life forms; the past is the direction of ever-increasing sameness and oneness. 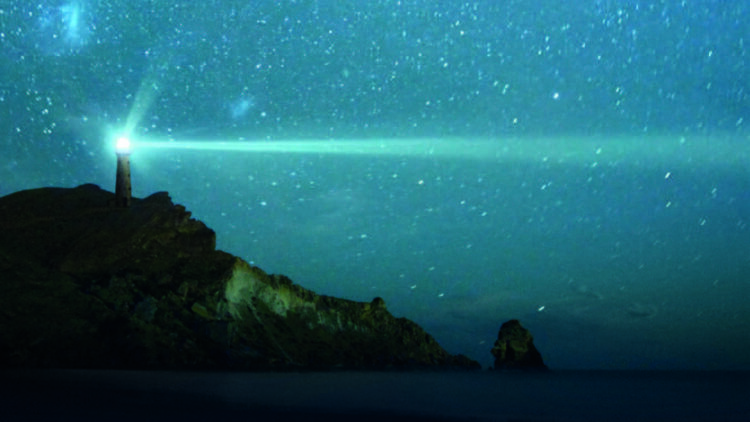 If you follow that backward path far enough to reach “oneness,” you also reach death. So, according to this principle, is racial separation in accord with the natural laws of Life and evolution? Does racial separation serve the Life Force and true morality, or hinder them? Seen in the light of this principle, are “racial equality” and a “diverse” society in accord with the natural laws of Life and evolution? Do the ideas pushed by the media and the power structure and the churches and the school system today — that “there is only one race, the human race,” that large-scale racial mixture is good and inevitable, and that borders should be torn down — serve the Life Force and true morality, or hinder them? The law of ever-increasing differences as Life evolves is but one principle of evolution that our people must understand. But it is a most important one. If you do not understand it, there is almost nothing else you can understand rightly. What do I mean when I refer to organized Jewish interests and their allies and employees as The Enemies of Life? Is that a metaphor, or something very real? The Jewish power structure wants a slave world, a world in which other races cannot compete with the apex-level Jews for power. The European race’s best minds are just as intelligent and more creative than those of the Jews. Thus we are a threat to their power, to their apex status. Replacing us with lower races through racial mixing and outright replacement is their plan. The plan is sold to the gullible as “love” and “diversity” and “morally right” through the mass media in the hands of the Jewish elite. But this vision of a Jewish world, their slave world, is a static vision of a materialistic “paradise” of masters, slaves, eunuchs, pleasure, and plenty. It comes from a mentality very different from ours. It is an earthbound Middle Eastern vision, not a Faustian and cosmic European vision of ever-increasing knowledge, and ever-increasing advancement and expansion and improvement. It would mean death for us in the short term, and quite likely the death of any chance for Life to escape the bonds of Earth. Thus all those who promote racial mixing, globalism, open borders, and the death of the White race are the Enemies of Life. What exactly do I mean by “cosmic stakes”? Again, you are probably starting to answer that question yourselves after following my ideas to this point. If our race does not survive, Life has no meaning for us. But even further, if our race does not survive, all Life may well perish as a result. No greater tragedy is imaginable. Both I and Dr. Pierce have said this before, but it is worth repeating: Everything that will ever be depends on what we do with our lives right now. With our new spiritual and scientific knowledge — with the principles we at the National Alliance have been teaching you — with our glorious gene-patterns that remain undimmed as long as White men and women exist — we can and will have new Shakespeares, new Aristotles, new Pierces — new scientific discoveries, new lands and new worlds, new philosophies, and beauty and truth and accomplishment greater than ever before. Athens and Rome and Berlin were only the barest beginnings of what is to come.